So I was making a shirts, after everything is done, I add the seam allowances. Everything going on well except for the hemline on the front shirts. It is distorted. 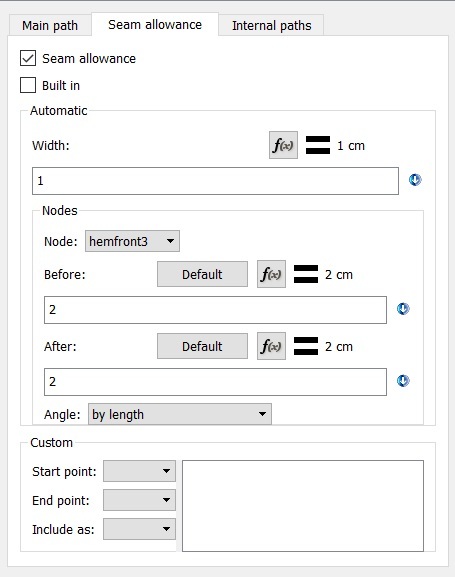 It seems I traced the order of nodes wrong but I re-check and it doesn’t seem to be it? What do I do wrong? The order should be hemfront5-hemfront3-hemfront-hemfront4. 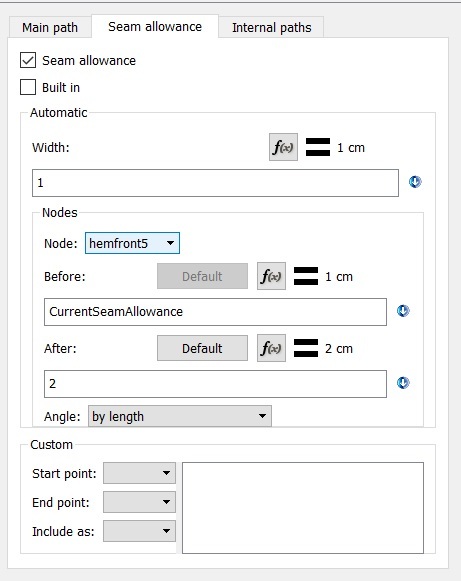 Checke the nodes in the tab “Seam allowance” of the window you show. You seem to have messed up there. You probably wanted to have something like 1 cm before hemfront5, 2 cm after hemfront5, then 2 cm before and after hemfront 3, hemfront and hemfront 4 and 2 cm before to 1 cm after hemcurvef. I suspect that you have something about 1 before and after hemfront4 and/or hemfront, then something about 0 after hemfront 3 but 2 before hemfront3. Hm, this looks quite normal indeed. Which version of Seamly or Valentina are you using? 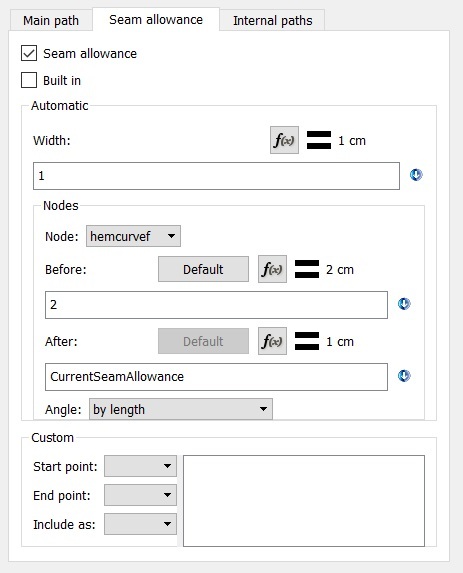 Change the hemcurvef to be CurrentSeamAllowance before and after. This will keep the seam allowance even over the curve. Change the hemfront4 to be CurrentSeamAllowance After. 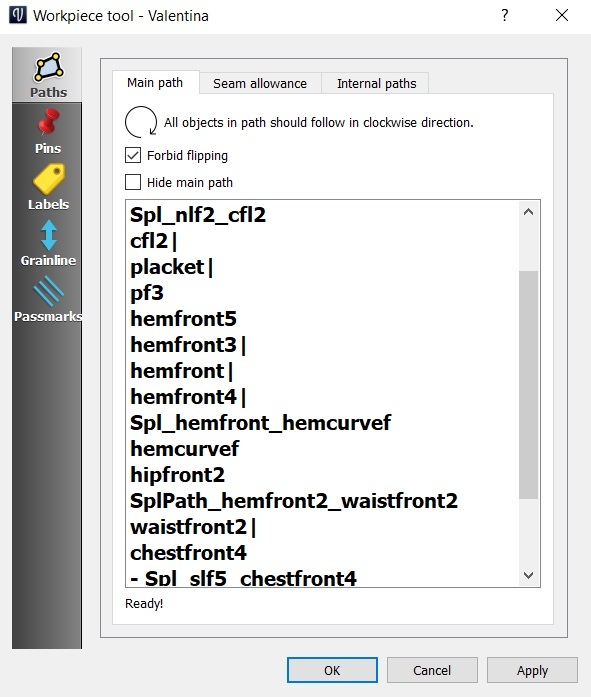 This should make the seam allowance between hemfront and hemfront4 to be sloped. Hopefully that will sort out the gap between hemfront3 and hemfront. If this isn’t what you want, please load your file (.val) so we can try things to see how we can achieve what you want. Funny thing: the seam in your detail looks quite ok when it is only default. I still suspect it does something wrong; if I include it I get some funny detail-outline going down to hemfront2. 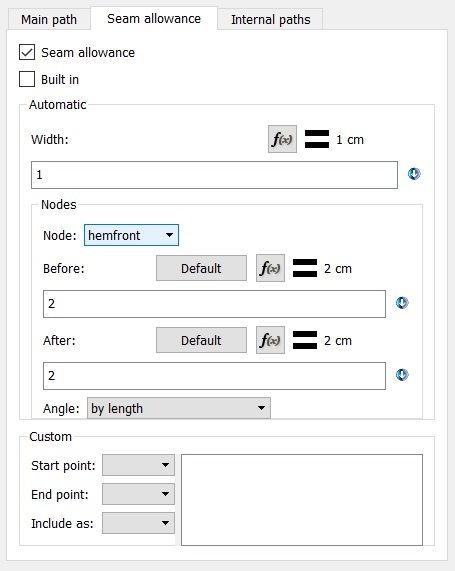 I think if you need hemfront4 you need to make a point there with intersection of axis and spline. That really is the problem! I didn’t realize at all. Maybe because I made it while being sleepy. Thank you very much! Btw, do you know why the passmark won’t show up on some points even though they are marked on the details? @Grace Yes, that’s the problem! So it was the same problem as earlier. Thank you very much!